Pumpkinfest Is Comin’ Back Oct. 25—Get Ready for #Franklinstein! 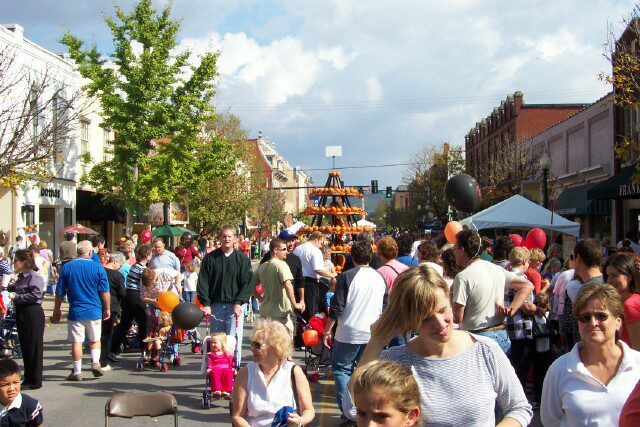 Franklin’s favorite fall celebration is returning to Main Street this month, and this time it’s bigger and better than ever. The 31st annual Pumpkinfest will take place on Oct. 25 from 10 a.m. until 8 p.m., bringing a full day of free entertainment to families in the area. Presented by the Heritage Foundation of Franklin & Williamson County, the festival will stretch along Main Street from First to Fifth avenues, and will also include portions of Third and Fourth avenues. Attendees can expect a day of live music, various contests, an array of arts and crafts booths, a chili cook-off and much more. In addition, The Great Pumpkin will be making an appearance at Pumpkinfest after traveling across the country from Franklin’s sister city, Carleton Place, Ontario, Canada. Festivalgoers will have the chance to participate in a “Guess the Weight” contest where one lucky winner will take home a $50 gift certificate to Stroud’s Barbecue. Two stages offering continuous entertainment from 10 a.m. until 8 p.m. The Bethel University stage at City Hall will feature five performance groups from Bethel’s Renaissance program: two bluegrass bands, a Southern gospel quartet, a 15-voice group and a 55-member choir. The School of Rock stage at Five Points will feature a variety of local performance schools and regional groups. Then at 5 p.m. on the School of Rock stage, The People’s Church will present the Battle of the Bands, a competition between four teenage bands—the winner will go home with a cash prize of $500. For band audition information, email Danielle at dberg@thepeopleschurch.org. Children’s activities will be located on Third Avenue South, and will include pumpkin painting, free games with small prizes offered by several local non-profits, pony and train rides, inflatables and more. A separate area of attractions for older children will be available on Fourth Avenue North, and will feature bungee jumping, a mechanical bull and a spider web mountain. More than 80 arts and crafts booths will feature unique, handcrafted wares that complement fall and the holiday season including jewelry, food and home décor items. Booths will be open along Main Street from 10 a.m. to 6 p.m.
Over a dozen food vendors will be selling traditional street festival favorites like corn dogs and hot dogs, barbecue, funnel cakes and kettle corn, as well as fresh bagels, gourmet coffee, fish tacos and jambalaya. A community swing dance will commence at 4:45 p.m. on the Public Square to the sounds of 5 Points Swing. Unsure of your swing dance skills? Local dancers will be there to warm you up with brief instructions before the band starts up. The Franklin Tomorrow Chili Cook-Off will feature 15 teams competing for the 12th annual title. A $10 ticket includes a 2 oz. sample from each team, and beer will be available for purchase in conjunction with the Chili Cook-Off. The tent will be located on Third Avenue South, between City Hall and the Courthouse, where competitors will be serving from 10:30 a.m. until 4 p.m.
An extreme pumpkin carving contest will feature the Leiper’s Fork Carving Club and their work. The public will have a chance to vote on their favorite carved pumpkin, plus the opportunity to purchase one via silent auction. Children, adults and even pets can compete in four categories during the annual costume contest. The categories are: pets; children, ages 0-2; 3-5; 6-11; 12+ and groups. Registration is limited to the first 40 entrants in each category and includes a $2 entry fee. Those who wish to participate can sign-up from 10 a.m. until 1:30 p.m. near the Bethel University Renaissance stage at City Hall. Competition will begin at 2 p.m.
Offsite parking will be available at both Harlinsdale Park and The People’s Church, with trolley rides to downtown for $1 per person each way, which will run from 9 a.m. until 6 p.m. Pets and strollers are not permitted on the trolleys. Pumpkinfest is produced by the Heritage Foundation of Franklin and Williamson County and its division, the Downtown Franklin Association. The annual October festival is just one of the many activities presented by the non-profit group, which was founded in 1967 to protect and preserve Williamson County’s historic, architectural and geographic resources. For more information, call 615-591-8500!